This is a weekly feature we are going to put out every Friday. We are going to look back at something big in sport a game, a series, a tournament, a moment something of importance. We will take you through the event, the history, why it was important and what happened next. As usual any questions, or anything you think we should take a step back in time for Comment, Tweet or Email us. Let the smoke clear and the engine on our time machine cool down. You’re Beautiful by James Blunt is number one somehow. England is gripped by cricket, the greatest Ashes series of all time is ongoing as the dominating Australians are in town. The 4th Test at of this series is at Trent Bridge and things are finely balanced. Australia took the first game and England snook the second by 2 runs. We are in sunny Nottingham on Day Three of the test. Ricky Ponting, one of the greatest Australian batsmen of all time, is at the none strikers end as Damien Martyn prods the ball into the covers and shouts “Go”. Ponting sets off towards the strikers’ end as Gary Prat throws the ball, smashing the stumps ending Ponting’s innings. What makes this moment so remarkable? We will get there, but trust me with this we have a lot to cover. So we need to go forward to go back. The Ashes in recent years had not been a happy time for the English. Heading into 2005, England hadn’t won the urn since 1987 meanwhile the Aussies had been dominating world cricket. The summer had started the way that so many had in the past, Australia romped to victory in The Lords’ test. Australia put on a huge 384 in the second innings and things were looking all too familiar. Steve Harmison, who was England’s main bowler took 8 wickets over the course of the match but it seems like Australia had too much batting. Both of England’s innings in the First test lasted a combined 37 overs (it actually makes modern collapses look fantastic). Roll onto Edgbaston. Some people say this is the greatest test match in history and it has to be bang up there. Before the game, the build-up was full of mind games, that the English players talked too much and couldn’t get a good pitch. The Australian cockiness led to them putting England into bat and they thanked them but by putting on over 400 runs. It isn’t the start of this game, it’s how it ended that lives forever in the memory. Australia needed 282 and found themselves 47 without loss, looking set to take a 2-0 series lead. Freddie Flintoff bowled like a man possessed and Australia were quickly 48/2. At the end of day four, Australia needed 100 runs and England only two wickets to win the match. Shane Warne lost his wicket for 43, leaving England needing one wicket. Brett Lee and Michael Kasprowicz were at the crease and chipped away at the lead. With two runs needed, Geraint Jones took an athletic catch, and England won. Leading to the iconic photo below. After the finish in Birmingham, everyone could have done with a more relaxed test at Old Trafford, that wasn’t what they got. Though rain delayed a lot of day three, both sides but on over 600 runs across both innings. There was another day five that would do down in history. England had declared, Australia was chasing 399 to win the match. Ricky Ponting, batted for over 7 hours racking up 156 runs which was the first Australian century of the series. Australia were 354 for 9, Glenn McGrath and Brett Lee were at the crease and England look set to win the match. Lee and McGrath had other ideas, batted out the remaining overs leaving the series tied 1-1. This brings us to Nottingham. England made a very strong start in Nottingham, they ended day one on 229-4 and the second day got even better. Lunch on Day 2, England were 344-5 and built to being all out for 477 (I know reading this in 2018 you will not believe that England batted for a day and a half). The Australian innings got off to a disastrous start, by stumps at the end of the first day Australia were 99 -5, things were going very well for England. Australia came out on Day Three and decided the best thing to do was attack, but it was too little too late. Australia finished 259 runs behind England and we’re going to bat again. This wasn’t something that Australia wasn’t used to doing and they wanted to make England pay. As day three rolled on, England began taking advantage of their substitute fielders. Their bowlers had been bowling for a long time, they would frequently go to the pavilion for a rest and a sub would come on. Ricky Ponting, the Australian captain was not pleased with this tactic, growing angrier that England was abusing the rule. The follow-on had started well for Australia, Ponting was looking unbeatable and people were wondering if England had gotten it wrong and then we reach our moment. Gary Prat, the sub fielder who was on for Simon Jones, ran out the Australian and he lost it. Ponting went on an expletive rant about the way the English were abusing the rule, resting their bowlers. Though Simon Jones had an injury that in effect ended his England career. Ponting took particular aim at Prat, saying he can’t believe he was run out by a sub. The rage that Ponting felt was only going to get worse. Australia went through a mini-collapse and all out for 387. This left England needed 129 to win which, they racked up with three wickets to spare at the end of day 4. Why was this moment so important? England went onto win the Ashes after the match at The Oval was drawn and the long wait for victory was over. Since that summer, England hasn’t lost an Ashes series at home they even went onto win one away. 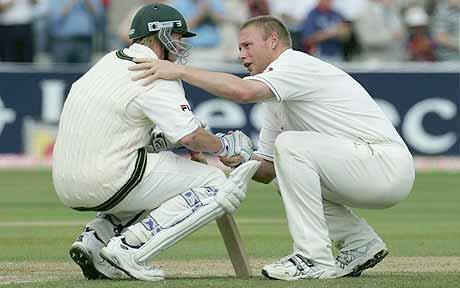 This series shot Kevin Pietersen and Freddie Flintoff into stardom, all be it booze soaked stars. The nation went cricket mad. Current England stars Jonny Bairstow, Joe Root and Ben Stokes have all said that their love for cricket grew watching this series as kids. The influence that it had can still be felt today. Unfortunately, things didn’t pan out well for Prat, who retired from the game early and currently plays minor counties cricket. Ultimately, the legacy if this moment may not be as large as some others that we will cover in these features, however, if you ask any England Cricket fan this is a moment that will always live in their memory.